“I have respect for Forrest. He’s a good fighter,” Rua said. “I (fought him) first in the UFC. (And) for me, everything was different because every time I (fought), it was in a ring. For me, it was very different. Now, I’m ready for a fight (in the Octagon) and (in) this fight, I’m 100-percent. 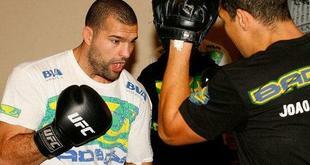 As the days to fight night continue count down, Shogun is planning to avenge a loss that many picked him to win. By returning to absorb the teachings of his old Chute Boxe coach, and gaining a renewed focus after losing his light heavyweight title to current champion Jon Jones, Rua is improving every day he is in the gym. The training partners he works with have provided him with the tools necessary to prep his body for the bout. The connection they all have is second to none and contributes to Rua’s motivation to perform well and be victorious on Aug. 27. But while the physical part is covered by Rua’s sparring partners, the mental portion belongs to his coach, Cordiero. “Every day, I see a different Shogun,” Cordiero said about his fighter. “He (trains) with great motivation because he trains with his old partners for the fight. It’s important he trains with guys (with which) he has a good connection.